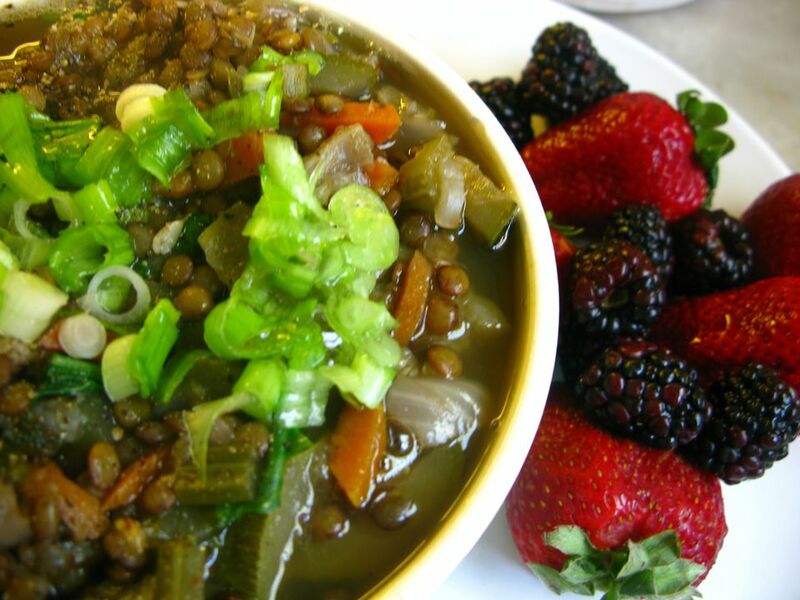 Lentil soup is loaded with protein and can easily suffice as a meal along with a salad, and perhaps some whole-grain bread. This hearty, heart-warming soup has few ingredients and is quite simple to make. You can leave it unblended and chunky, blend half, or blend it all -- whatever suits your personal taste. Recipe reprinted with permission from What's Cooking America by Linda Stradley and Andra Cook (Falcon Pub). In a large soup pot over medium-high heat, combine ham or bacon pieces, lentils, and chicken broth; bring just to a boil. Reduce heat to low and simmer 1 to 1-1/2 hours or until lentils are soft. Remove 2 cups of cooked lentils and place into or bowl; let cool 5 minutes (if you do not let cool slightly before processing, mixture will explode out of container and make a mess in your kitchen). After cooling, whirl until pureed. Stir pureed lentils into soup mixture. In a medium frying pan over medium-high heat, saute onion and carrots in butter or margarine until limp, but do not brown; add to lentils. Add thyme, nutmeg, salt, and white pepper. Simmer another 30 minutes. Remove from heat and serve in bowls. Cream of pumpkin soup - an autumn favorite.